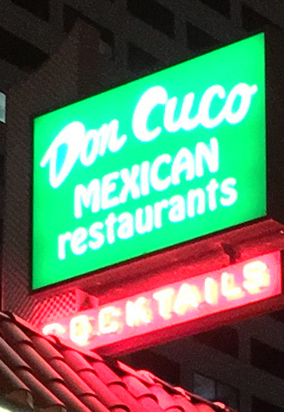 (1969) Don Cuco, Toluca Lake | Remains of L.A.
-It’s all wonderfully warm and cosy, with red lights and red booths and tables, each booth is separated from the others with wooden railings and pillars, and there’s a fake roof overhead — the kind with those rounded clay tiles — so it’s like everyone is sitting on the front porch of a house. 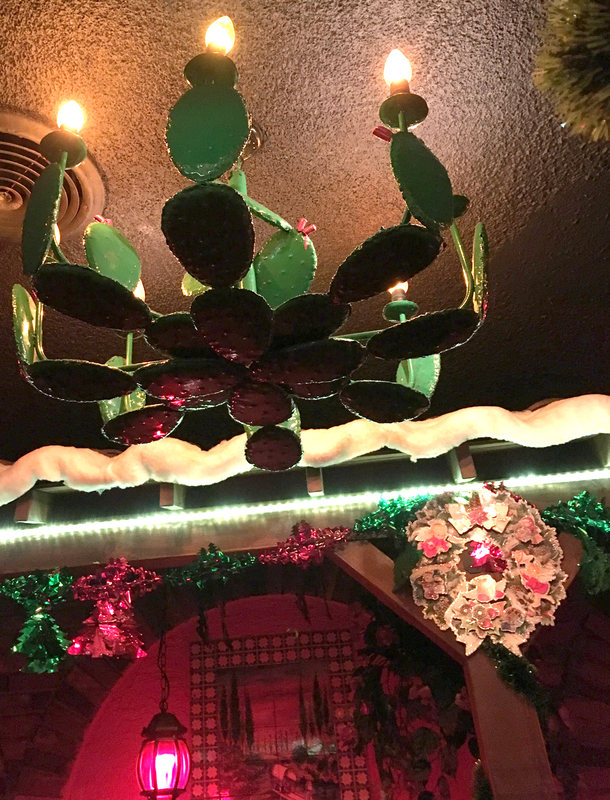 Because we were there in late december, there were lots of Christmas decorations everywhere, tinsel and fake snow on the fake roof, blending nicely with the colorful decorations there year-round; tile pictures and sombreros hanging on the walls and the most amazing chandeliers that look like giant cacti . The front room is long and narrow with booths on either side; at the end is an arched doorway and through it a second, similar room. To the right of the front room is a bar with tiled mirrors and tall stools. 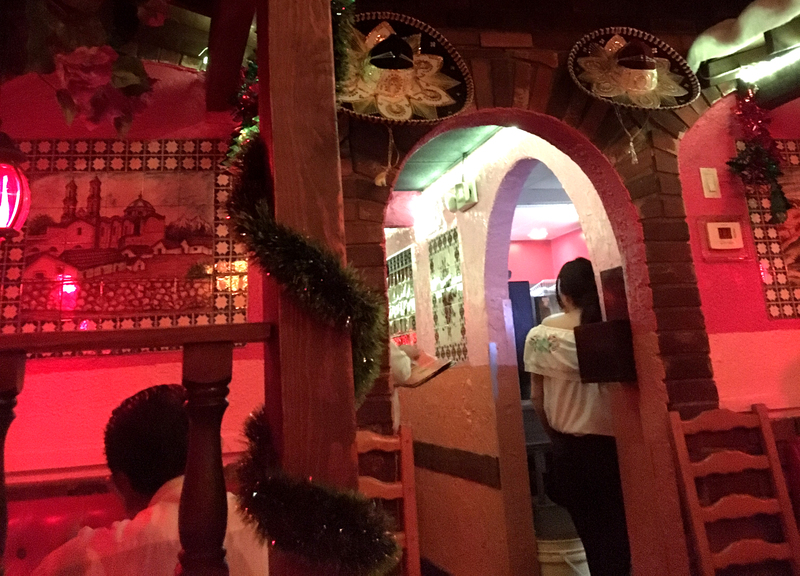 Each booth has a little tile picture in the wall, ours was of a hacienda with mountains behind it, and the tables have colorful tiles too. 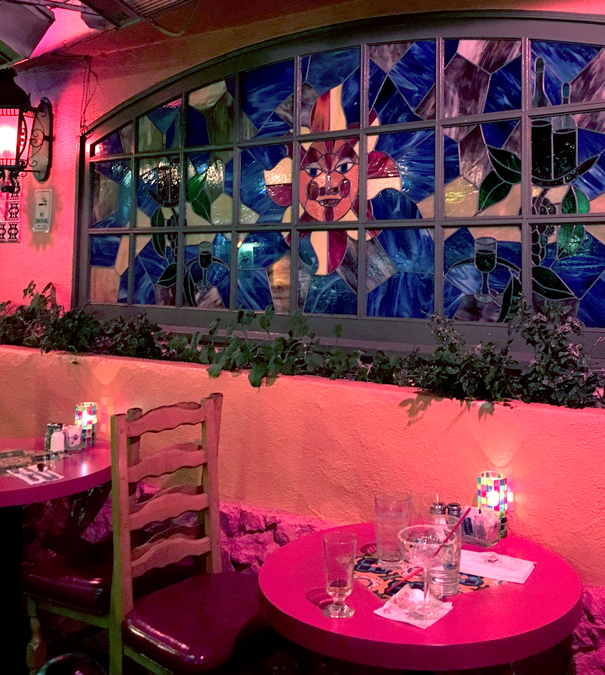 Outside, the front of the restaurant is stunning, with a huge stained-glass window with a picture of the sun and a patio with round tables and lanterns. There’s a railed-in balcony on the second floor, with more stained glass windows, but David (my husband) pointed out that there’s no actual way to get to the balcony unless you climb through a window. It’s too bad because I’d like to eat out there, but anyway it looks lovely. 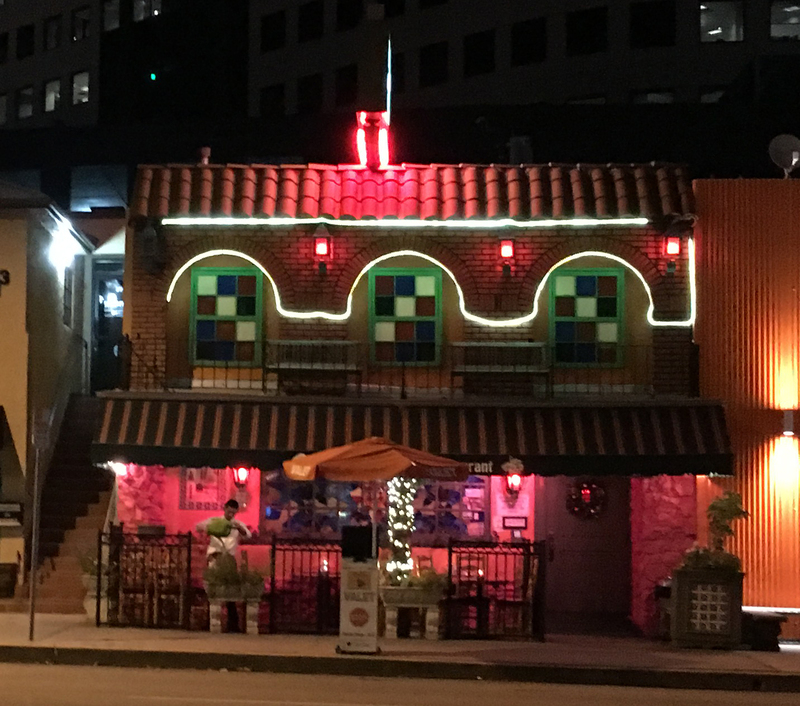 -I got the steak and chicken fajitas, which were great and the waiter was very nice about bringing more tortillas when I needed them. I guess I don’t put as much stuff in the tortillas as I’m supposed to, but there’s really a massive amount of food and no way is a few tortillas going to hold it all. David (my husband) got the Cochinita Pibil which the menu said was a traditional dish from the Yucatan Peninsula, and which came with little fried bananas. Also we had chips and salsa and guacamole. -I arrived a few minutes before David (my husband) and was seated in the back room, near a couple of tables of people who were quite loud. They left before we were done eating and it got a lot quieter. They weren’t being rude, just enthusiastic and happy to be out together. But it was very loud. -At one point the table of young people behind me were having a raucous conversation about credit cards, what they do to your credit rating, and which ones give you the best points. That is different than what my friends and I talked about when we were young loud people, but maybe my credit isn’t as good as theirs is going to be someday. 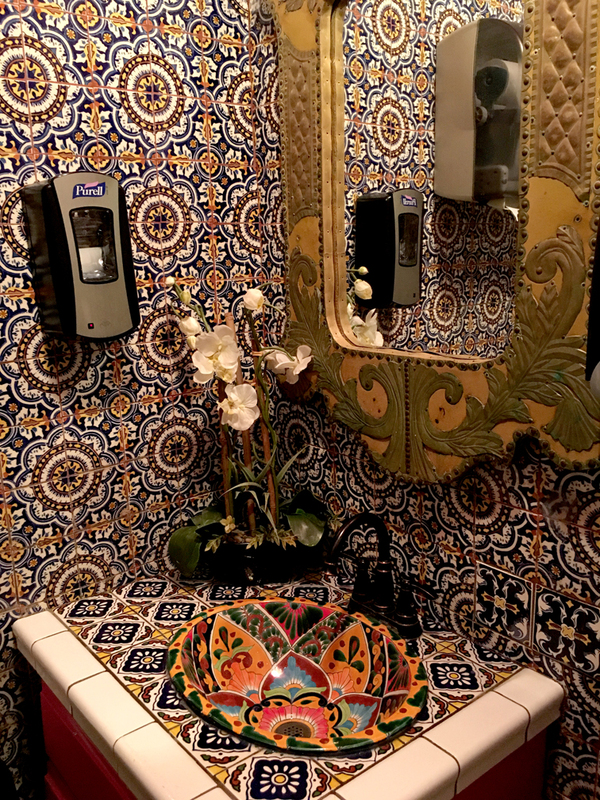 -The ladies’ room is covered in amazing busy tile with a beautiful tile sink. It is fantastic. Also the sign on the door is very pretty, with a picture of a lady standing in a meadow by a stream. -There was a candle holder on the table with squares of stained glass that the light shined through. Usually when you see those the glass is kind of frosted but this wasn’t, it was very bright and pretty and David (my husband) said it looked like a puzzle but made out of candy. -When my water came there wasn’t a straw and I hate that because I so much prefer straws because otherwise my mouth gets cold but asking for a straw makes me feel like the highest-maintenance person in the world. “Oh, this beautifully refreshing glass of water doesn’t come with the method of conveyance I most prefer.” That’s how I feel like I sound. David (my husband) offered me the straw from his margarita but of course it had sugar and alcohol on it and also he was using it. I just asked for a straw, they gave me one, it was fine. -The waiter asked if we wanted flour or corn tortillas and we asked what he suggested, and he said “flour” at once, definite it was the right choice. I love it when waiters have strong ideas about what I should order. -A woman near us kept saying “And that’s on a good day! That’s on a GOOD day!” while chortling loudly. I couldn’t hear anything else she was saying so I don’t know whether it really was impressive/funny that whatever she was describing was on a good day. -Some of the waitresses wore those off-the-shoulder tops. They look cute but would drive me crazy; I’d be constantly trying to pull up the sleeves. -When the people next to us stood up, I saw this one guy’s shoes. I felt kind of bad for him because they were awfully ugly shoes, bright white and shaped weird. But then everyone else with him started going on about his amazing shoes, and I remembered I don’t really know anything about shoes. -Leaving the restaurant, I noticed that one of the tile pictures above one of the booths was of a sun with a face. This isn’t a nice sun, like in the window, or in some of the other pictures. This sun looks like he is a serial killer and thinks it’s funny we don’t know. 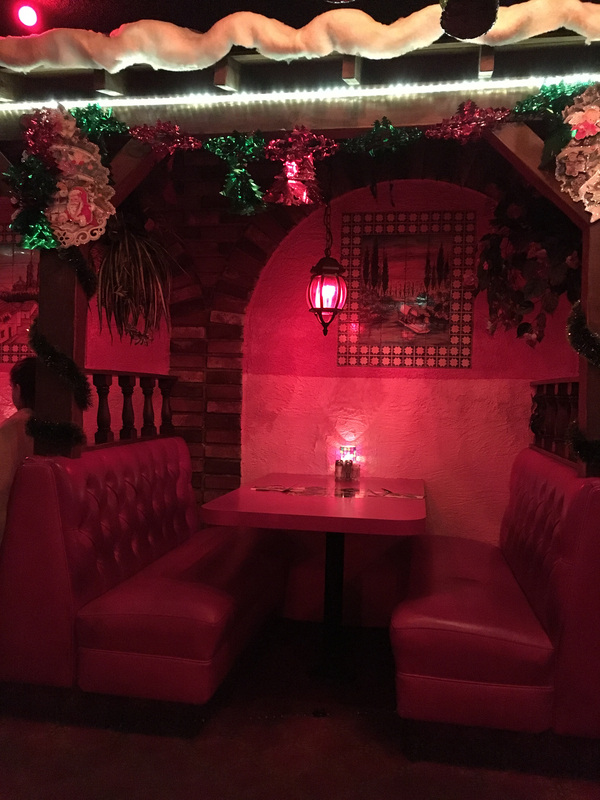 I’m glad we didn’t sit in that booth; I don’t think I’d be able to eat for fear. What I Ate: Steak and chicken fajitas with onions and peppers and refried beans and rice and flour tortillas; guacamole; salsa; chips. What Sort of Ghost I’d Expect to Find if I Believed in Ghosts Which I do Not: A young man who hitchhiked to California to join an artist’s commune, where he learned how to make stained glass. His first big job was making one of the windows for the new Don Cuco restaurant. He likes to sit and watch the sun shine through the window, and see the colors change as the sun sets.